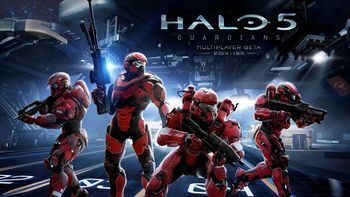 The Halo 5: Guardians Multiplayer Beta also known as the Halo 5: Guardians Arena Multiplayer Beta was a phase in the development of Halo 5: Guardians, produced by 343 Industries and organized by Microsoft. Purchasing Halo: The Master Chief Collection gave players access to the beta, which was made available on December 29, 2014 and ended on January 18, 2015. It was first revealed with a teaser trailer shown at Microsoft's E3 2014 media briefing. The focus of the beta was on small maps with 4v4 arena gameplay. A notable difference to Halo 4 was the absence of custom loadouts; every player started with identical equipment. A notable addition in the beta were the new Spartan abilities, which will replace the armor abilities from the previous games in Halo 5: Guardians. 343 Industries described the beta as traditional in that it would be used for the intended purpose of beta testing and gathering feedback for a game still in progress, as opposed to merely showcasing a largely finished product for marketing reasons. The beta featured eight maps, three game modes, eleven weapons and thirteen sets of armor. The beta also allowed users to offer feedback on things like power weapons, maps, and game modes in the Halo Channel. Despite appearing in multiple promotional images and screenshots for the beta, the Technician armor was not available in the beta. A promotional splash screen for the beta. The default Xbox controller layout for the beta. The Halo 5: Guardians Multiplayer Beta main menu. The service record in the beta. Spartans in the Breakout gametype. First person view of the Prophets' Bane. A Spartan with a rocket launcher. A Spartan using the Ground Pound. A game of Breakout begins, with Spartans about to be launched into the arena. The newly introduced team victory screen.